Make your French toast a little more special by using cinnamon swirl bread and topping the toast with fresh fruit and yogurt. To reduce prep time, use frozen French toast. Note, nutritional information may change. Combine the topping ingredients, except for fruit, in small mixing bowl. Refrigerate. In a medium bowl, beat together eggs, milk and cinnamon. Preheat a non-stick skillet over medium heat and lightly coat with nonstick cooking spray. Dip each piece of bread into the egg mixture and coat thoroughly. Plave in skillet and cook for about 2 minutes on each side. 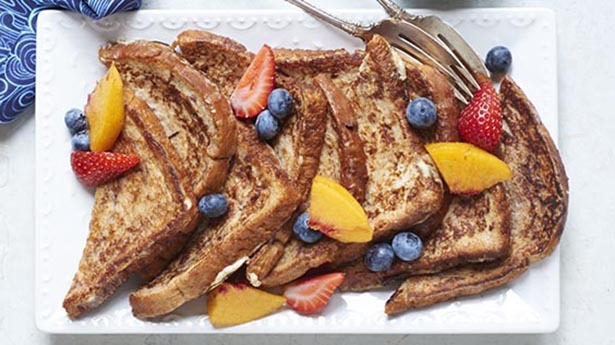 To serve, cut warm French toast on the diagonal. Arrange on plate. Top with fruit, then the yogurt mixture.